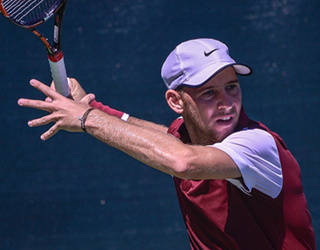 Dudi Sela of Israel, above, won the men's singles title for the fourth times by outlasting John-Partick Smith of Australia 6-4, 7-5. on Sunday, August 23, at Hollyburn Country Club. Photo 2: Johanna Konta of Great Britain celebrating winning the women's single crown. Johanna, the winner of 2013 singles title in Vancouver, upset No.1-ranked Belgian Kirsten Flipkens 6-2, 6-4 in the final. Johanna teamed up with Maria Sanchez of the US to win the women's doubles final with a 7-6, 6-2 win over the Canadian Sharon Fichman and Carol Zhao. Photo 3: The 29-year-old Kirsten Flipkens, the top seeded at Hollyburn, is ranked 87 in the world. Kirsten reached the semis in the 2013 Wimbledon where she lost to the eventual champion Marion Bartoli. Photo 4: In the men's doubles final, Treat Huey of Philippines, left, and Frederik Nielsen of Denmark took out Yuki Bhambri of India and Michael Venus of New Zealand in a close match, 7-6, 6-7, 10-5. Photo 5: Unfortunately, former World No. 8 Janko Tipsarevic had to withdraw due to an injury. Janko was seen taking time to pose picture and signing autograph with the fans. Photo 6: The 26-years-old Latvian, Ernest Gulbis, who came within a point of defeating world No. 1 Novak Djokovic at the last week's Rogers Cup - was eliminated in the first round by Illya Marchenko of Ukraine, 6-3, 6-7, 7-6. Photo 7: Radek Stepanek was another recognized name in the tournament who eliminated in the first round. He lost to the 2013 runner up, Daniel Evans of Great Britain, 6-4, 6-1. Daniel, a qualifier, lost in the semis to John-Partick Smith. Photo 8: Philip Bester of North Vancouver a lucky loser who lost in the last round of qualifying to Argentina's Guido Andreozzi , 6-4, 2-6, 6-2, was the only Canadian in the main draw. Philip got unlucky for a second time and lost again to Guido, 6-4, 6-3 in the first round.